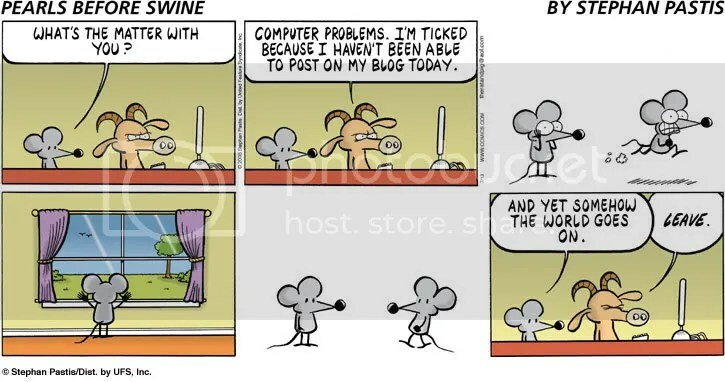 I saw this comic in this Sundays paper it made me think about the blogsphere and how for many blogging becomes a major part of their lives. In our society it is very common to be greeted with a “how are you?” This has to be one of my biggest pet-peeves. I think it has to do with the fact that 95.7% of the time when people ask me how I am that’s all they are doing is just asking, hoping I’ll respond with a “I’m good, thanks” I can’t help to think to myself though. Why do we say we are good, fine, great, or dandy instead why don’t we tell the truth. Now, maybe the truth is you are fine but i suppose maybe it’s my want for more information that makes me wonder WHY are you fine, WHAT makes you good. I often try to refrain from using the phrase how are you for this very reason. Happy [late] 2008 everyone! This is my first blog of the New Year and I hope everyone who reads this had a good Holiday Season and a glorious start to this New Year. I hope to return to my regular blogging schedule soon! One thing I find interesting about the New Year is New Year’s resolution. It seams there are two types of people, those who make them and break them and those who used to make them but stopped because they knew they couldn’t be kept. I fall into the latter. However, I would encourage you to try your best to keep yours if you made one this year If not pick something and maybe it’s not a resolution just something you want to do and do it! I also recently read this article on 100 things we didn’t know last year. I find it entertaining and fun to read. I also find this song to describe our lives in here in America it’s written by John Reuben and is called Chapter One found on his CD boy vs. the Cynic. The Boy Vs. The Cynic, Chapter one, page one. I found it interesting, this week it snowed in Seattle. I come from a town where if it’s December and there isn’t a couple of feet on the ground something is seriously wrong. So when I moved to Seattle a couple years back and it snowed for like 10 min and everyone ran outside I was wondering what was up. Every year I’ve been here since it’s snowed at least once. I love to watch the snow fall, but what I love to watch even more than that is how people around me like to watch the snow fall. It’s fun to watch there faces light up, watch them run to the windows or run outside in pure excitement and to watch frowns turn to smiles. It’s a small thing, a snow flake, yet it can instantaneously change the mood of a person. Snow is just one of the things I like about December it seams to be one of the many things that it coincides with is Christmas. Christmas is one of my favorite season not because of the gifts, the hot coca around the fire, or even the occasional snow. It’s because of the way people treat others. The way they are more willing to help one another. The way they donate more money, time and energy to causes, the way people try to be jolly at Christmas. I often like to think of this other times of the year. Yet, I can’t help but wonder why people aren’t like that all year around. Is it that we only have two months of good will in us and then it’s dry? Is it because we can only be nice for so long before we’ve had enough? Possibly it is because we put ourselves as priority number one. I honestly don’t know why it is. I would like to challenge you to think about the way you treat others, how generous you are all year around. As I was walking though an automated I saw and heard something that took me by surprise. Maybe this was something that shouldn’t have taken me by surprise. Perhaps I’m just over reacting. Then again, maybe I’m right. Of course, now you’re probably thinking to yourself “what did he see?” Well I saw a young girl (probably 4-6) walking though entering the door as I was exciting and as the door opened she said “thank you door.” I smiled and sort of laughed at this looking at the gentleman she was with who simply gave me a slight smile like I was crazy and we all went on our ways. If you are like me you like to take things for granted, we live in a society where everything is fast, fast food, fast news, and fast communication. I often forget to “slow down and smell the roses.” It’s funny how often times it’s children that we turn to when we need to be reminded of life’s little lessons. In 1971 Nike Inc adopted the slogan “just do it.” I find this slogan to be a very interesting one. The slogan could mean a plethora of things depending on the meaning of the word “it” in the saying. Maybe, “it” is interpreted as a positive thing thus encouraging one do something positive. Perhaps, “it” is negative promoting various types of misconduct in society. Although “it” could be anything it’s interpreted to be, I believe “it” may just mean living life and doing what needs to be done. As expressed in my previous entry I often struggle with lack of motivation. It’s not until I come to the realization that I need to “just do it.” I need to stop waiting for the world to change and start changing the world. I need to stop not pursuing my dreams and just start doing whatever “it” is that will help me obtain my goals. This is going to be a different type of blog than I normally write. Instead of being about the craziness of the world, or the happenings of my life, this blog is going to about causes I support. I’ve been on this thing for the last year or so where I’ve been looking at a lot of non-profit and even some profit organizations that are trying to better the world. This blog is going to be a list of those organizations. The HOPE Project– Providing education, health care and hope for the children in Moshi, Tanzania. The Bridge– A simple act of art can help support the cause of your choice. Love requires action.